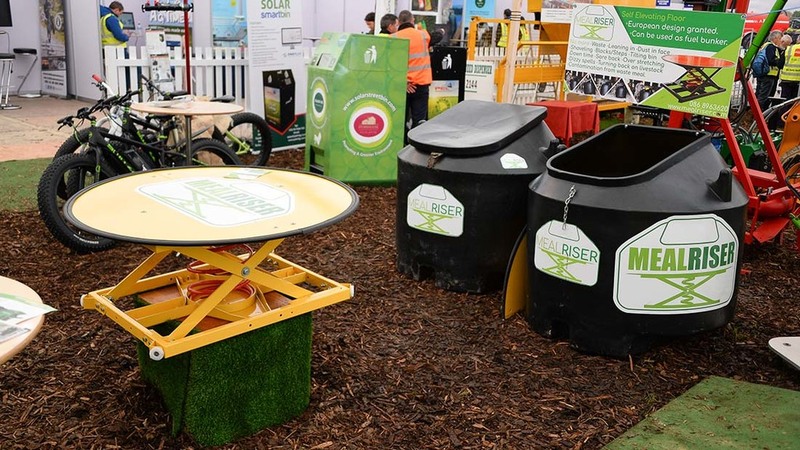 Featuring 69 companies from all over Ireland, one of the highlights of the Irish Ploughing Championships is the Innovation Arena hosted by Enterprise Ireland. James Rickard explores some of the novel ideas. Speeding up filling times while at the same time keeping staff safe, contracting company, Colgan Agri has come up with a mobile slurry tanker filling arm. Based near Tullamore, County Ofally, the outfit is no stranger to a winter project and its latest creation can either be mounted on the front links of a tractor or free standing. Fed by a separate slurry pump, usually mounted on the rear linkage of the same tractor, the machine is said to be capable of top filling a 10,230 litre (2,250 gallon) slurry tanker in under a minute. Once filling is complete, the operator can then continue to use the slurry pump to stir the slurry store. To get into position, the arm features two hydraulically-operated articulation points, and it can also swivel. To aid accuracy, a camera is fitted to the end of the arm. Using the event to gauge interest in the machine, Colgan Agri says it would be interested in licensing the machine to a manufacturer to build and sell the product. 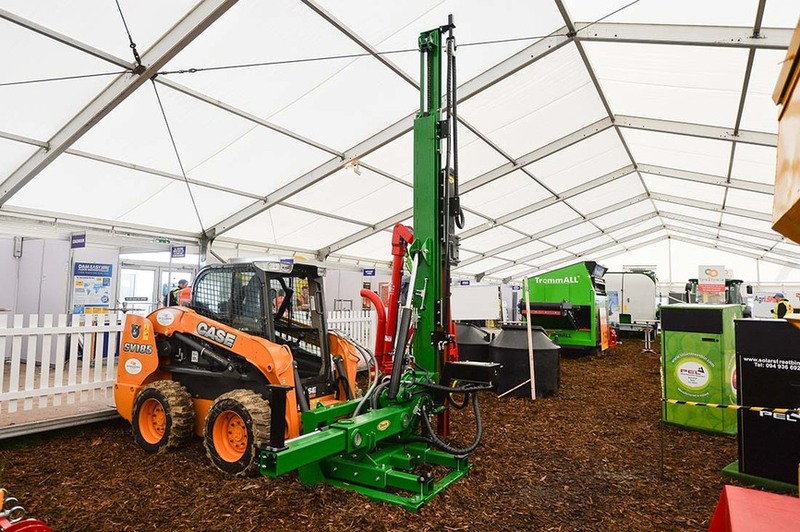 Putting an Irish twist on a New Zealand-made drill, importer Tom Tierney has drafted in Doyle Engineering to fit one of its air seeders to a Duncan drill unit. 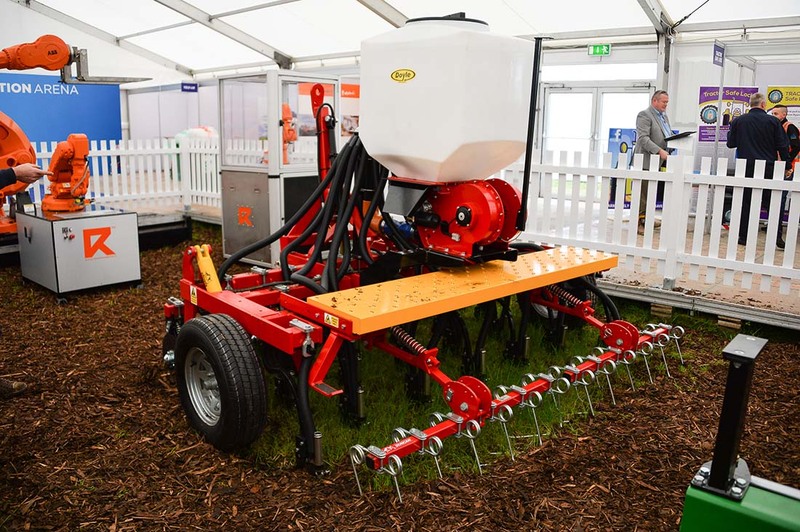 The result is a tine seeder able to drill directly into stubbles or pastures, suitable for establishing cover crops or ‘over seeding’ grass leys, respectively. The Duncan drill element consists of a set of cutting discs, preceding three rows of staggered coil tines used to establish the crop. Row spacing is 150mm, with a following harrow bringing up the rear. Sending seed to each of the drill’s tines is the Doyle Engineerings’s element of the drill, an 18-outlet pneumatic seeder with electrical fan drive. 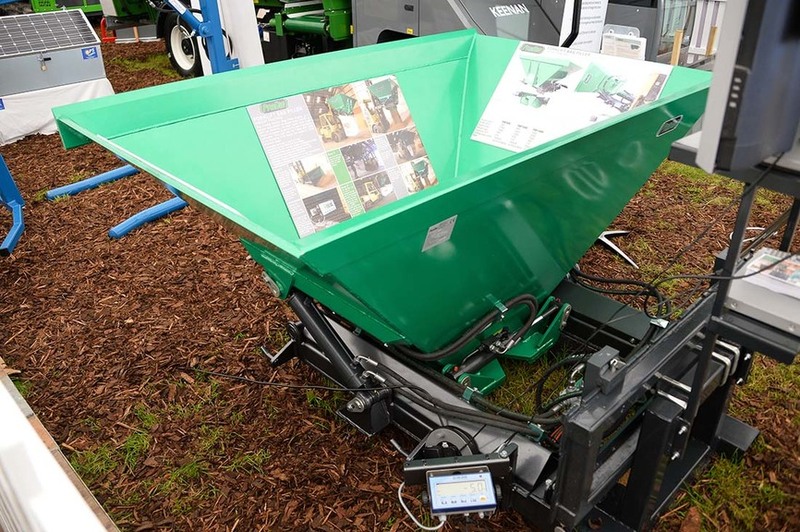 The hopper has a 400 litre capacity and is said to be capable of establishing up to 50kg/hectare of grass seed at 15kph. A GPS speed sensor takes care of automatic rate control, with the ability to alter rate via a control box in the cab. In addition, fertiliser can be applied via tubes down the back of each tine, supplied by a separate hopper which could be mounted on the tractor’s front linkage. The 2.7m wide drill will be available within the next couple of months, with prices TBA. Developed on farm, the Dangan Meal and Nut Dispenser has been designed to save labour and time when feeding stock. The modular unit comprises 2.4m (eight feet) sections of trough which can be bolted together, on top of which is a hopper which runs along them on rails. The trough can be fitted with an axle and tow-bar allowing it to be moved from site to site. The farming-based firm says the machine can be used in fields, yards or sheds. 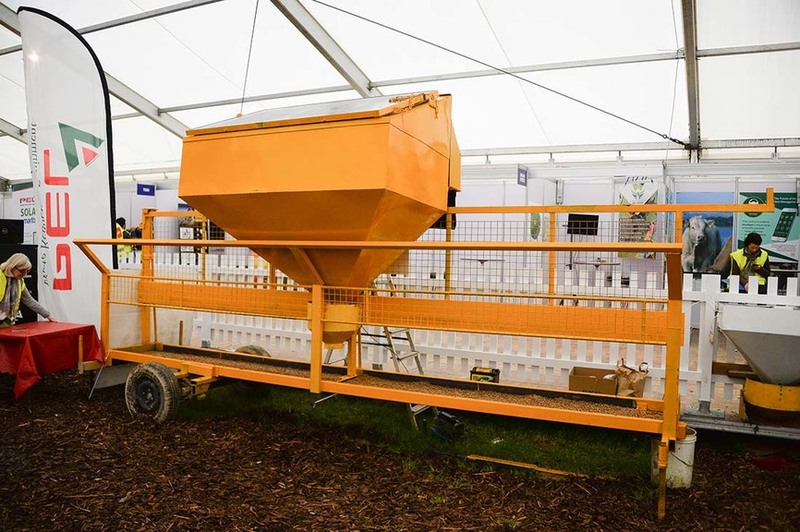 Electrically powered, the hopper can hold up to one tonne of feed and can be used manually via a remote control, or automatically via a timer. Dispensing rate can also be adjusted, and to keep power topped up, it also features a solar panel. A 4.9m (16 feet) version of the machine retails at £2,830 (€3,200). Said to offer several benefits to slurry tanker operation, not least improved safety, Safeshaft System showed its alternative to pto power; a hydraulically driven unit used to power a tanker’s vacuum pump. Sold in kit form which includes mounting bracket, hydraulic motor and various valve options, the system bolts in between the tanker’s vacuum pump and drawbar. Negating the need for a pto, this is said to dramatically improve safety, particularly in an area where operators often come within close proximity of the pto. Because it is hydraulically driven, it also means the tanker can be powered by anything which can supply a constant flow of oil; a telehandler for example. It also means there is no pto to catch on link arms on and no pto to disengage in corners. The latter is said to offer a more consistent spread pattern as the pump can remain running when turning. The pump requires about 45l/min of oil flow to run, with hydraulic motors matched to a tractor’s capability when ordered. When it comes time to sell the tanker, the unit can be removed and fitted to another machine. All units are galvanised and can be specified with manual or electric hydraulic valves – the latter can be controlled remotely. The basic kit costs £1,640 (€1,850) plus VAT. 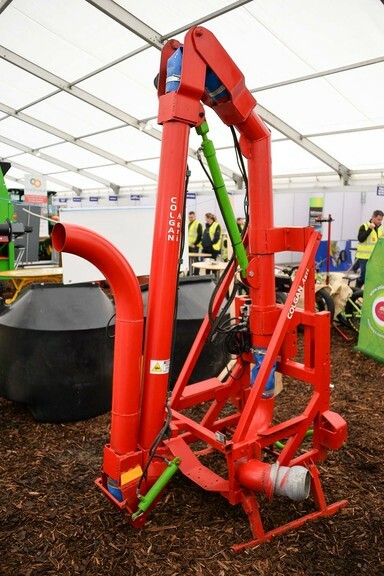 Claimed to be the first of its kind, County Carlow-based company, ProDig has come up with a bag filler which incorporates a weighing system. Two versions of the system will be available; one which sees the weighing system fitted to the frame in which the hopper sits, allowing the contents of the hopper to be weighed; and one which sees the weighing system fitted to the bag hook from, allowing the contents of the bag to be weighed. Available in three model sizes; 0.6cu.m, 1.0cu.m and 1.4cu.m, the unit on show is designed for forklifts as an alternative to a static bag filler and weighing system. Using a forklift’s often single hydraulic auxiliary, a diverter valve is incorporated into the machine to switch between the hoppers’ tipping action which allows it to fill itself like a bucket, and the hydraulically operated doors used to regulate material flow. The latter can also be remote controlled. Available now, the firm says it is going to roll out the weighing option across the rest of its bag filling range. You know a machine means business when it is called the Rambo 300, and County Kildare company, Doyle Engineering is hoping its specialised post driver will do just that. 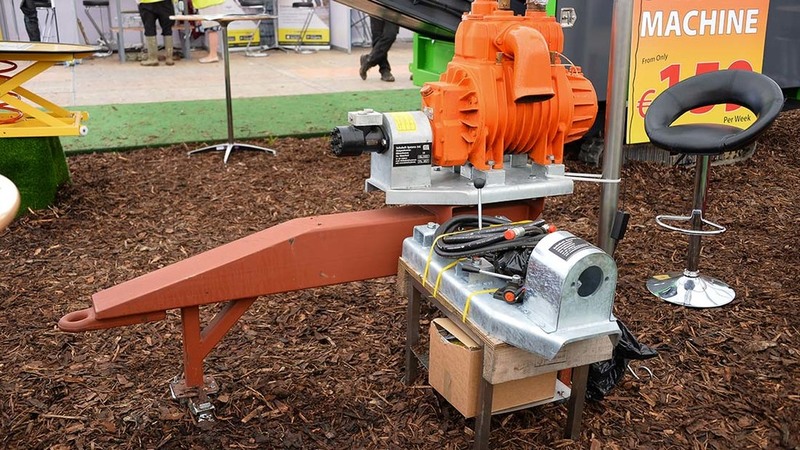 Originally designed to sink metal C- and H-section steelwork into the ground as framework for solar farm projects, the firm suggests the machine could be used for a variety of steel structures, where traditional concrete footings are not required. For stability, it is recommended the machine is used with a loader, allowing it to be placed on the ground while it drives in the posts. Post driving is via a hydraulically-driven vibrating hammer. Requiring about 80l/min of hydraulic flow to operate, the machine features external controls allowing several adjustment; side shift, back shift and mast tilt. The 1,400kg machine features a 4m stroke and can be folded down for transport. Retail price is £26,550 (€30,000). 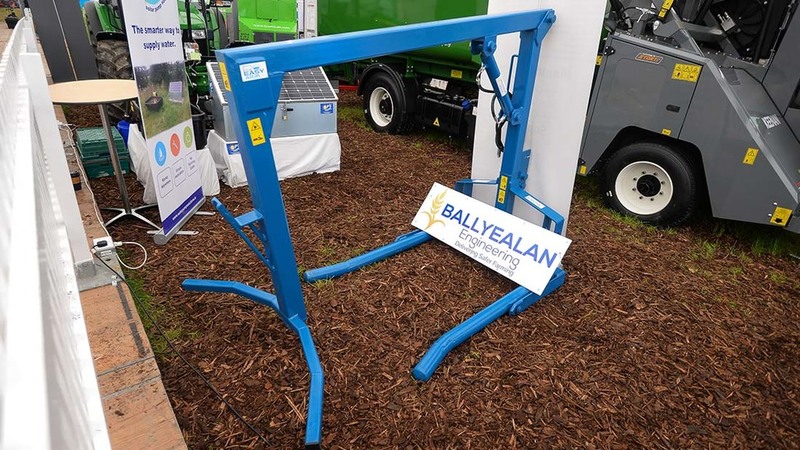 Allowing both a round bale and a feed ring to be handled by the same attachment, County Offally company, Ballyealan Engineering has come up with the Easy Arm. Rather than man-handling the feed ring into position, the one loader attachment can be used to take the bale to the ring, lift the feed ring, place the bale on the ground, and replace the ring over the bale. This also allows the feed ring to be moved to a ‘fresh’ site, and lets you unwrap the bale while it is safely on the ground. Designed to primarily save your back, but also make cleaning out those last few bits in the feed bin a lot easier, Meal Riser has come up with a novel mechanised solution. As the product/company name suggests, the system uses a sprung-loaded platform which automatically rises in the bin as the product gets used up, which therefore gets lighter. Preventing product from dropping between the raising platform and the sides of the bin is a seal. The firm says the system can be fitted in 10 minutes and is compatible JFC round meal bins. 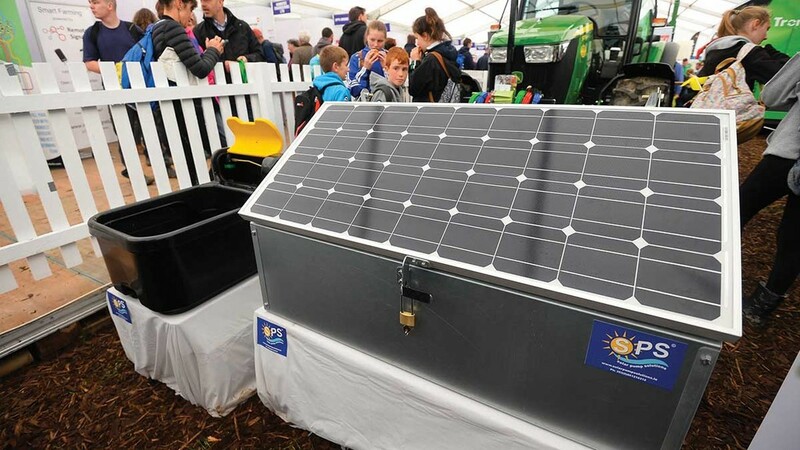 Ideal for outlying land with no water supply or arable farmers taking on stock, for example, County Tipperary company, Solar Pump Solutions has come up with a solar powered water pump. Three models are available, with the middle model shown able to pump water up to a distance of 1.5km and supply up to eight troughs. It can also cope with rises of 50m, says the manufacturer. Water sources can be streams, rivers, springs or wells, for example, with the firm claiming the system requires little to no running costs. This is thanks to its electric pump being powered by solar panels. Power is stored in a 12V battery, allowing the pump to continue working in the dark. It also allows an electric fencer to be powered from the same battery. For transport and security, all pumping and electrical components are secured in a steel box with lockable lid. The CE-approved pump is available direct from the company, with prices starting from £1,280 (€1,450).